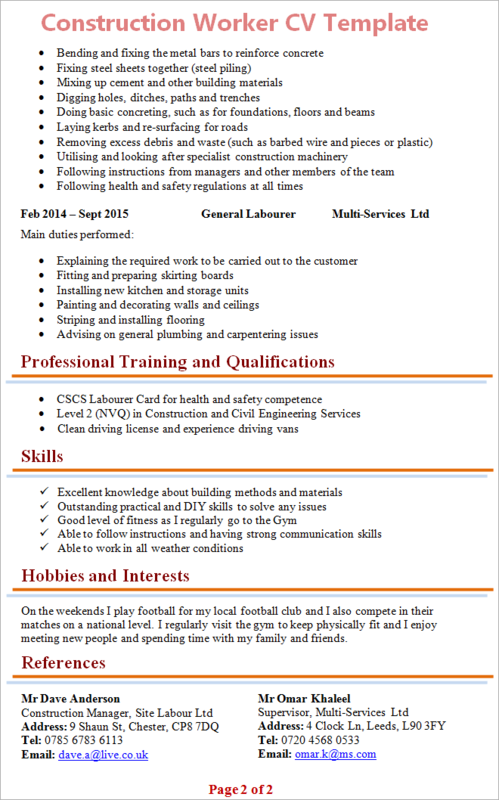 Tip: Use the Construction Worker CV Template below as an example to help you write your own personal and fully-tailored CV. I am a capable, hands-on and experienced Construction Worker with excellent practical skills and personal drive to complete tasks. I have gained substantial experience of working in the construction industry and I am currently looking for an opportunity that would allow me to develop my skills further and make a real difference in the building sector. I am an excellent team player, and I have the ability to complete any given jobs – supervised or unsupervised – to a very high standard. 2005 – 2012 GCSEs St. Christopher School Results: 11 GCSEs at Grades A*-C.
On the weekends I play football for my local football club, and I also compete in their matches on a national level. I regularly visit the gym to keep physically fit, and I enjoy meeting new people and spending time with my family and friends. State on your CV that you can and are willing to work in all weather conditions. Focus a lot of your CV’s attention on your practical skills, experiences and abilities because working as a Construction Worker means that you will constantly be on your feet; lifting, digging, assembling and building things on a daily basis.